Experience our luxury domed railcars traveling roundtrip from Anchorage. Enjoy dinner and a show at the Music of Denali Dinner Theater at McKinley Chalet Resort featuring family-style dining and a spirited original musical about the first men to reach the summit of Denali. With two nights at Denali National Park and a night at Mt. McKinley Princess Wilderness Lodge there’s ample time to experience the abundant wildlife and to catch a glimpse of the "Great One." Unless noted, tour is not escorted and does not include meals, sightseeing or home city air. Please call our Alaska Reservation Specialists for more information. The Alaska Railroad corridor lies between the mountains of the spectacular Alaska and Talkeetna ranges and journeys past sparkling rivers and through the legendary Matanuska Valley, known for record-breaking farm vegetables like a 92 lb. cabbage. By afternoon you’ll arrive in Denali National Park. Visit the tour desk to discover what optional excursions are available in the area. Overnight Denali-area hotel. You'll continue your journey to Talkeetna on our domed railcars. You’ll stay at the beautiful Mt. McKinley Princess Wilderness Lodge, featuring quite possibly the most awesome view of the "Great One" in the state. Once there, you’ll have time for optional activities such as flightseeing and river tours. Overnight Mt. McKinley Princess Wilderness Lodge. 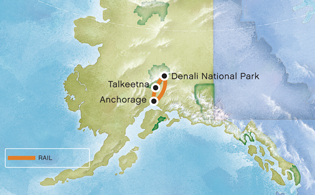 Today, explore Talkeetna and Denali State Park in Denali's south side. Wake up for optional morning activities. Later, re-board our double decker railcars and begin the return journey to Anchorage. Your vacation in Alaska comes to a close at the railroad depot.